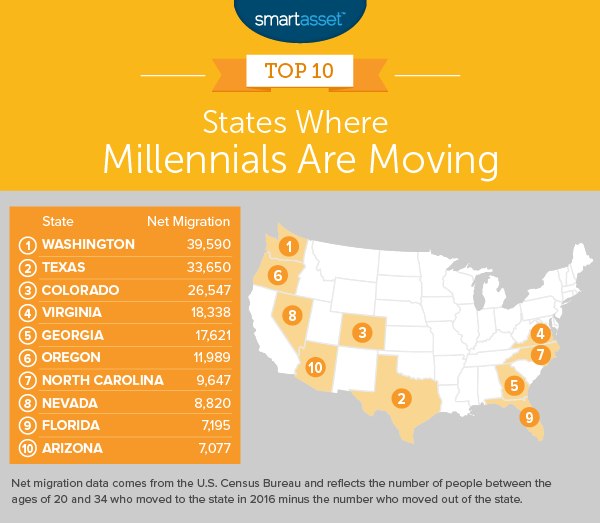 This is SmartAsset’s second annual study on where millennials are moving. Read the 2017 study here. Washington received the largest influx of millennials both in terms of net influx and net influx relative to population. This state received nearly 40,000 more millennials than it lost, which is around 0.55% of the overall population. Seattle was the main beneficiary of these millennials, which we’ll discuss in the section below. Washington was not the only western state to crack this top 10: Colorado, Oregon, Nevada and Arizona are also in the top 10. Colorado and Oregon in particular were popular landing spots for millennials. Colorado received over 26,500 more millennials than it lost and for Oregon that number was just under 12,000. Nevada and Arizona had slightly less spectacular numbers, receiving 8,800 and 7,000 millennials, respectively. Seattle was the most popular landing spot for millennials, according to our data. In total, nearly 30,000 millennials moved to Seattle while just over 22,000 moved out of the city. This left the city with a net influx of 7,300 millennials. That is quite a large number especially when you consider that Seattle is a city of only around 700,000 residents. It is not too surprising that millennials are flocking to Seattle, it is one of the best cities for young professionals and Washington has no income tax. Another state capital comes in third. Sacramento was a popular spot for millennials already in California. In total, around 10,000 millennials came to Sacramento from elsewhere in California, while only 5,600 left Sacramento for another part of California. After tallying up millennials immigrating and millennials emigrating, our data shows that Sacramento received about 6,700 millennials. In total, 21,758 millennials decided to make Minneapolis their new home and 15,229 decided to pursue opportunities elsewhere. Minneapolis was especially popular for millennials coming from other parts of Minnesota. Over 12,000 Minnesotan millennials moved to Minneapolis, while nearly 6,800 Minneapolis millennials moved from the Western Twin City to elsewhere in Minnesota. If Minneapolis becomes slightly more popular in the coming years, it could climb further up this ranking. It only fell short of Columbia in second by about 400 millennials. Jacksonville takes fifth. This city came in right behind Minneapolis, only separated from the fourth place finisher by less than 200 millennials. It isn’t too hard to see why Jacksonville is a hot spot for millennials. Florida has no income tax and in fact Jacksonville residents are some of the least taxed in the country. For millennials who want to live in a low tax environment and get started on retirement, it’s tough to beat Jacksonville. 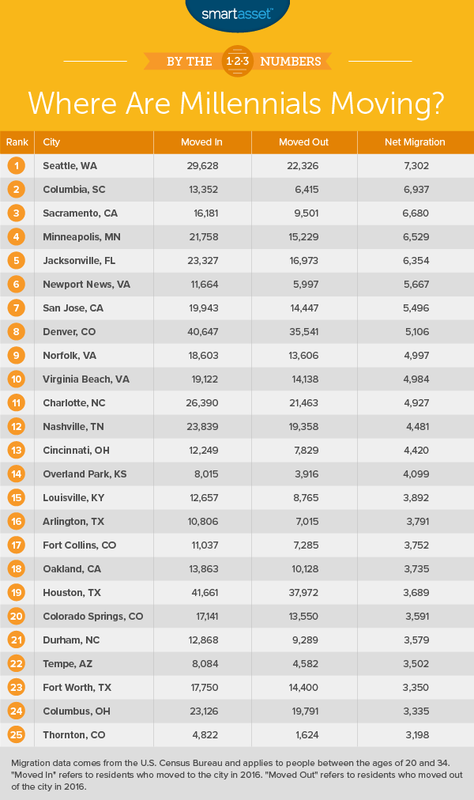 Newport News is the second-smallest city in this top 10. Overall this city saw its number of millennials increase by 5,667, thanks to 11,664 immigrating millennials and 5,997 emigrating millennials. If we were ranking millennials’ mobility relative to population Newport News would rank even higher up. According to our data, the net influx of millennials is equal to over 3% of the city’s population. San Jose comes in seventh. Like in Sacramento, you were more likely to see a millennial moving to San Jose from within the state than from outside of it. Of the 20,000 millennials who moved to San Jose, nearly 13,000 came from within California. Once again Denver is a popular spot for millennials, moving up to eighth place from ninth last year. Last year, we estimated that Denver saw a net influx of over 4,200 millennials while this year we estimate this city received 5,100 more millennials than it lost. Denver is a very mobile city with over 76,000 millennials coming or going. Our list ends with two Virginia cities. Up first is Norfolk, a top 5 finisher last year. In total Norfolk saw a net influx of just under 5,000 millennials which is a decrease from last year’s score. In total, 18,603 millennials moved to Norfolk while 13,606 decided to leave. The top 10 wraps up in Virginia Beach, a newcomer to this ranking. It was a tight race between the 9th, 10th and 11th place cities. Virginia Beach fell short of Norfolk by only 13 millennials and beat 11th-placed Charlotte by only 57 millennials. It was residents coming primarily from out of state that pushed Virginia Beach into 10th. In total, nearly 12,000 of the 19,100 millennials who immigrated to Virginia Beach came from out of state. 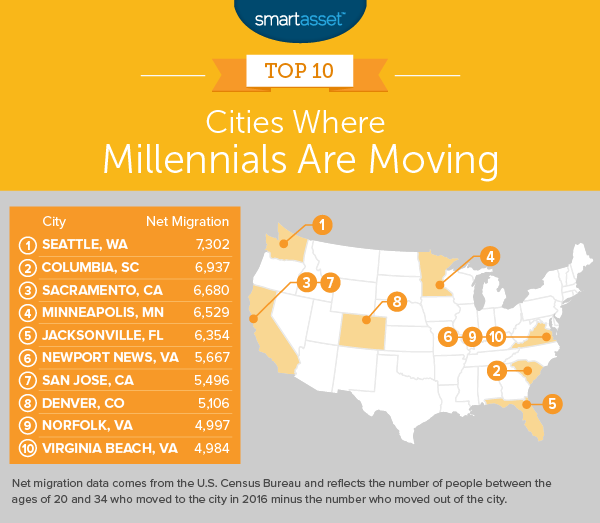 In order to calculate which cities and states millennials are moving to, SmartAsset compared 2016 Census Bureau migration data for 217 cities and all 50 states, plus Washington, D.C.
We compared the number of persons between the ages of 20 and 34 who emigrated from each city and state to the number who immigrated. We ranked the cities and states by highest difference between the number who immigrated and the number who emigrated for persons ages 20 to 34. Save before you are ready – While you may not have concrete plans to own a home in the next few months, if you know it’s part of your long-term goals, it’s a good idea to start saving now. In some cities, especially the ones with the highest costs of living, it can take many years of saving to afford a down payment. You don’t want to be in a position where once you decide you’re ready to buy a home you then need to wait a few years to save for a down payment. Extras can hurt – When shopping for a home you may have a good idea how much mortgage you can afford, but there are other important costs to keep in mind. For one, depending on where you live, property taxes can be sizable. The average home owner in the U.S. for example pays over $2,300 per year in property taxes. Don’t go overboard – It can be tempting, especially when buying your first home, to find a dream home and get attached to it. But if you find yourself attached to a home that is outside your budget, it is best to walk away. No dream home is worth sacrificing your financial future and stability.